Empty the packet of Koolaid mix into a container and add just enough water to dissolve it. Then place the grapes into the container and fill with enough water to cover them. We used a metal ladle to hold the grapes below the surface and pricked some of the grapes with a needle to see if making holes would help the Koolaid infiltrate. 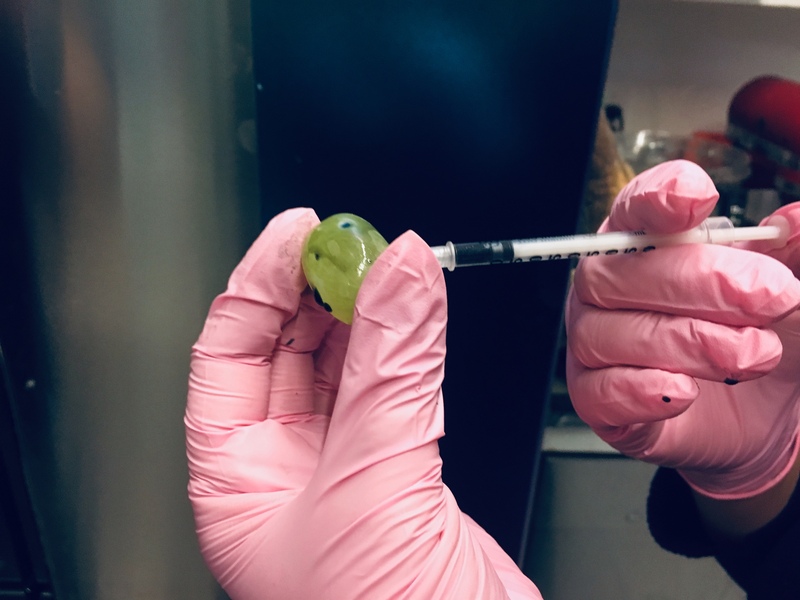 To inject grapes instead, fill a syringe with the Koolaid mixture described above and inject the grapes either through the skin or through the hole where the stem was attached. The Koolaid will spill out of the hole if too much is injected at once, so inject small amounts of a few milliliters in several spots rather than trying to inject the liquid all at once. The results after a few hours of soaking the grapes in the concentrated Koolaid were less than great. All of the grapes, whether pierced by needles or not, had split open, and the purple dye had stained the edges of the skin. The effect is interesting but not exactly going to fool our friends. We soaked a grape, a craisin, and a raisin in the Koolaid solution for a longer period of time. 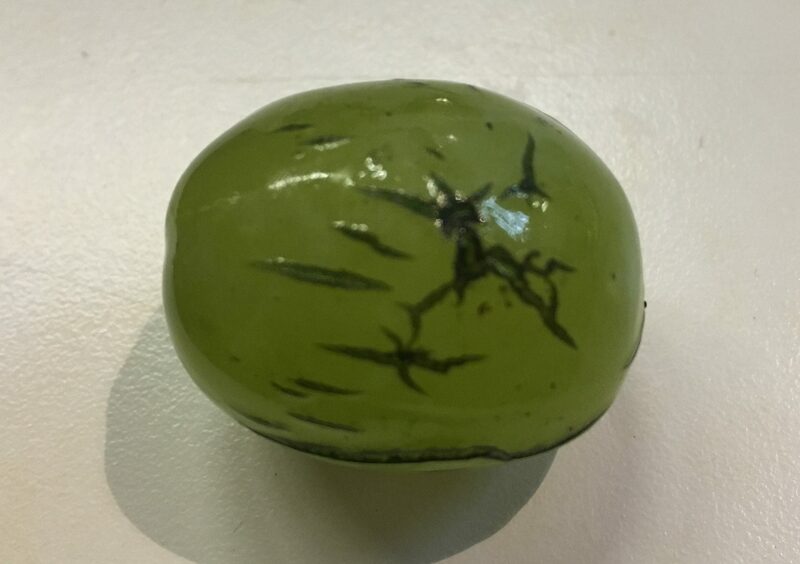 The artificial flavoring of the grape had a longer finish, but it was still not a strong flavor. The craisin had a squishy texture and tasted weird though still nicely tart. The raisin still tasted like a raisin but with an artificial kick. 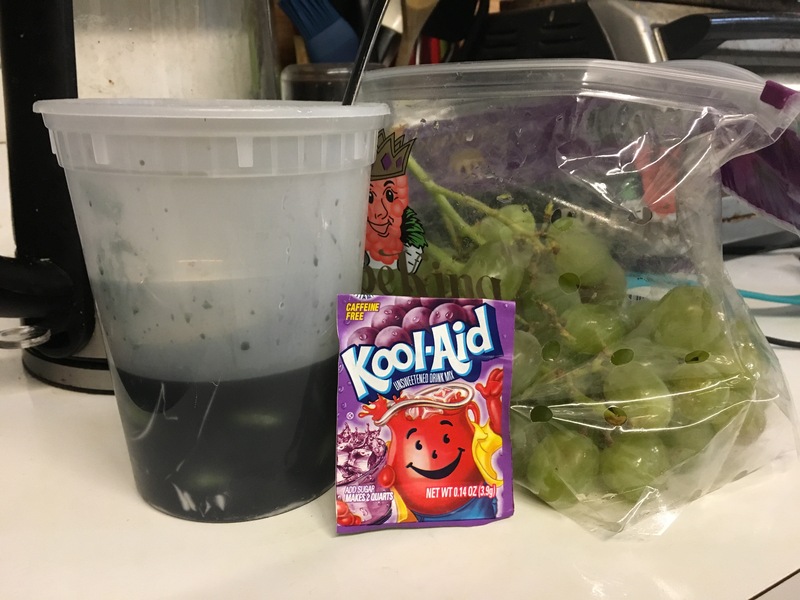 A grape, a craisin and a raisin soak in a Koolaid solution…. Kristen: The injected grapes turned my tongue purple, so that was cool, I guess. A lot of Koolaid leaks out of the injection sites, so without gloves my fingers were purple, too. There’s an intense grape flavor when you first bite through the skin, but only if enough Koolaid was injected (at least tens of mL). The steeped grapes obviously don’t look like undoctored grapes, and they don’t taste as strongly of grape flavoring. We probably should have added sugar to the Koolaid mixture to achieve osmotic balance and prevent the skins from splitting open.